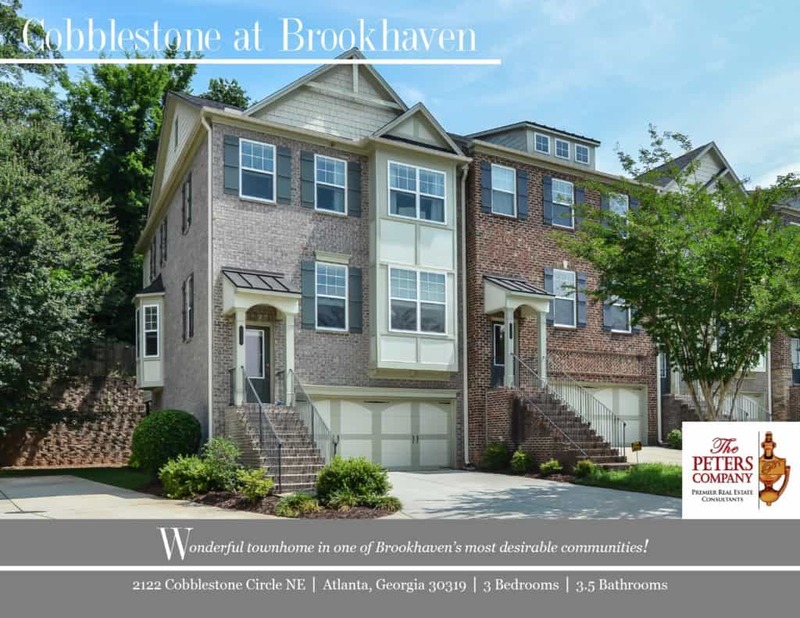 Just Listed :: Beautiful End Unit in Cobblestone at Brookhaven! Welcome home to this wonderful end-unit townhome in the popular Cobblestone at Brookhaven community. The floor plan, custom features, and charming character of this home will never go out of style. The close proximity to Peachtree Road, I-85, and GA400 make it convenient to and from any direction. Being in the booming city of Brookhaven means you can enjoy nearby hot spots like Town Brookhaven and Village Place Brookhaven! Kitchen features granite counters, stainless steel appliances, tile backsplash, pantry, breakfast bar, and breakfast room. Large living room has gas fireplace and built-in bookcases. A sunroom is perfect for a playroom, home office, etc. Hardwood floors, tall ceilings, and beautiful trim work are carried throughout the main level. Master suite is a true retreat including a trey ceiling, sitting area, and large walk-in closet. Master bathroom has a double vanity, garden tub, and separate shower. An additional upstairs bedroom is well-sized and bright with its own private bathroom. The finished lower level includes a bedroom and full bathroom. The garage easily fits two vehicles with extra space for storage. A large deck is ideal for outdoor enjoyment and entertaining. Wonderful community amenities include gated access and a well maintained pool. Call The Peters Company today to see this wonderful townhome at 2122 Cobblestone Circle NE… 404-419-3619! ← Just Listed :: Charming Cottage in Ashford Park!